Reconsidering the status and meaning of Bauhaus objects in relation to the multiple re-tellings of the school's history, this volume positions art objects of the Bauhaus within the theoretical, artistic, historical, and cultural concerns in which they were produced and received. 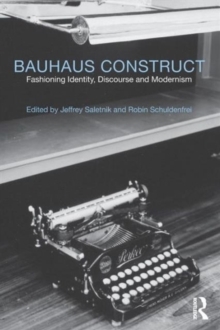 Contributions from leading scholars writing in the field today - including Frederic J.
Schwartz, Magdalena Droste, and Alina Payne - offer an entirely new treatment of the Bauhaus. Issues such as art and design pedagogy, the practice of photography, copyright law, and critical theory are discussed. Through a strong thematic structure, new archival research and innovative methodologies, the questions and subsequent conclusions presented here re-examine the history of the Bauhaus and its continuing legacy. Essential reading for anyone studying the Bauhaus, modern art and design.